I woke Thanksgiving morning tired and a little stressed. The day had turned into a big deal for our little family of four. Several weeks ago my father, who is a resident of a retirement home and temporarily in a wheelchair, spoke his desire to see no processed food (meat or otherwise) on the big day. 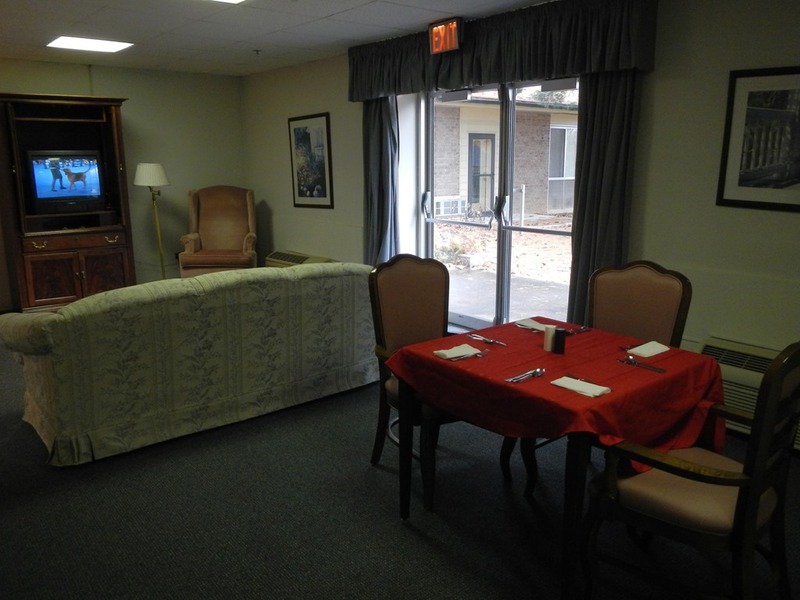 That meant that unlike recent Thanksgivings where we shared our meal in the retirement center dining hall, my sister Leslie and I would be preparing and transporting the meal. Thanksgiving for four can be as complicated as Thanksgiving for 20. We have our longtime family traditional meal like everyone else. 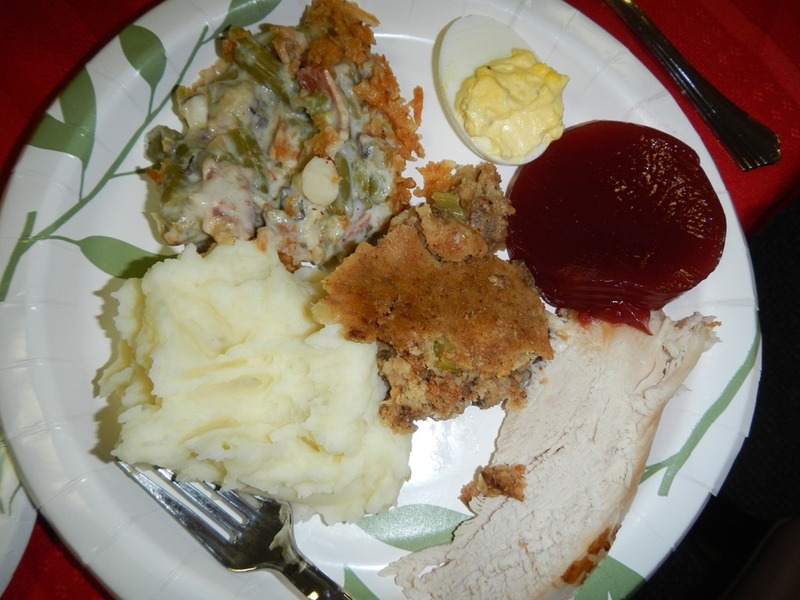 While we like turkey and love post holiday turkey sandwiches, my father is famous for saying that turkey is only an excuse for eating bread, mashed potatoes, stuffing and deviled eggs. He could do without the rest of the items except the fruit (specifically apple) pie. A couple of weeks ago, Leslie and I set about dividing the tasks of who will cook what (we prefer our sister Carol not contribute to the cooking for reasons left unsaid here). I drew the short stick with the turkey and fretted about it for a week or so. Do I cook a whole turkey for leftovers or just a breast?! Looking back, it seems like a no brainer. One night last week, while we were shopping in Fresh Market, John grabbed a Thanksgiving order form and signed me up for a nice 10-12 pound rotisserie whole turkey. Yeah, precooked and leftovers, the decision seemed right. With the big decision made, I made my list for my sides (cranberry sauce, mashed potatoes, green bread casserole, bread and apple galette) and did the shopping. I would breeze through prep! I was wrong. Heating what turned out to be a 13 pound precooked turkey takes several hours. Preparing the rest of the sides, carving the turkey, packing everything carefully so a sudden stop or curve would not result in the lose of one of the sides and preparing myself so I would look presentable really pushed my tired self to the limit. Did I mention my Dad likes to eat around 11:30 AM and I had a 20 minute drive drive with platter, pans and a crock pot in my car? As I walked out the door to head to the retirement center I surveyed the mess called my kitchen. Dishes were everywhere (I am a messy cook), mashed potatoes were drying on the wall behind the stove, flour from the galette was scattered on the counter, turkey grease filled tin cans in the sink and the floor had a few mishaps scattered about. Clean up would take hours. This is it for me, I declared to myself , I will not go through this again. I was late getting to the retirement center, Leslie was even later. Carol had rolled my Dad down to the room we had reserved for the festivities and he was hungry and impatient. When we finally got the cars unloaded, table set, candles lite and plates filled, my Dad gave the blessing. He talked about his thankfulness to still be here (he is 91) to share this meal with his three daughters. He said how grateful he is that his daughters dote on him, spend time with him and are willing to help him when he needs it. And he said how much he loves his girls. The meal went fast (as it always does). My Dad started falling asleep at the table so the daughters packed ” to go” containers for everyone, cleaned up the mess and repacked our cars. Carol rolled our dozing father back to his apartment while Leslie and I headed home.